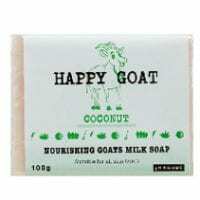 Active Ingredients include: Goat’s Milk, Vitamin E, Aloe Vera and extract of Kakadu Plum. Variants include calming Lemon Myrtle, intensely hydrating virgin Coconut Oil and purifying Oatmeal. Skin Types: For all skin types, perfect for sensitive, dry or irritated skin.